Jesus knew the Psalms well. How fitting that He prayed fervently in the Garden of Gethsemane the night of His betrayal, “let this cup pass from Me…” Matt. 26:39 Yet, He continued, “…may Your will be done.” (vs.42) Often I think of this “cup” as Christ’s agony or physical suffering. As horrible as that was, his “cup” reaches much deeper. The sinless Son of God had to be separated from His Father to bear the sins of all mankind. He bore your sins and mine. 2 Cor. 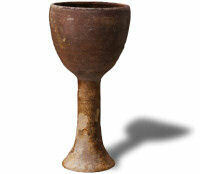 5:21 tells us “God made him who had no sin to be sin for us,…” Jesus became the “Cup of Salvation. !” Give Him praise and thanks daily!